When isn’t San Francisco the place to be? OK, maybe New Orleans during Jazz Fest, or St. Barts at your wedding; London for your royal whatsit. The Geek Universe is set to converge on Cupertino’s northern climes next week and lest anyone fear the festivities might be confined to Moscone Center’s sterile hallways, Party List is on hand to direct interested parties to the hippest, happening off-site and after-hours events during WWDC 2011. 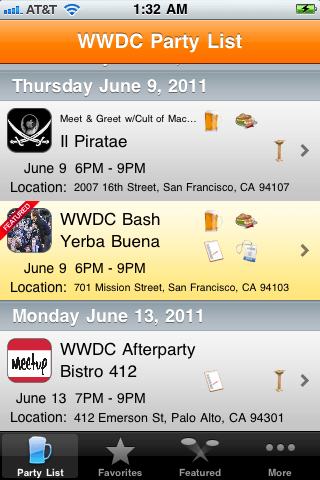 If you’re going to San Francisco for WWDC be sure to wear flowers in your hair, and be sure to have Party List on your iOS mobile device to keep abreast of the best of the after-hours and off-site gatherings going down in the Pearl of the Pacific. 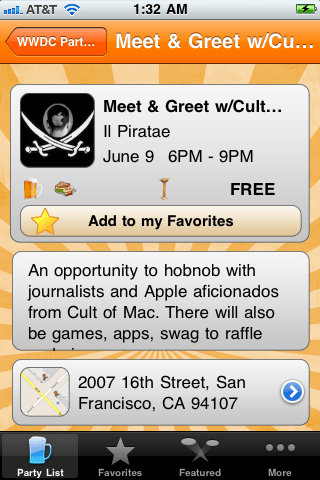 Of course, if you’re reading this – and if you’ll be in town – you should make a special effort to come by the Cult of Mac Meet & Greet at Il Pirata on June 9 from 6pm – 9pm, where we’ll have some raffles and giveaways and a chance to get up in the faces of some of the folks who are responsible for all the goodies you get on this website daily. Full Disclosure: John Brownlee was last seen somewhere on the East Coast and may not be available for your adulation/castigation. But don’t let that stop you from coming by, eh?